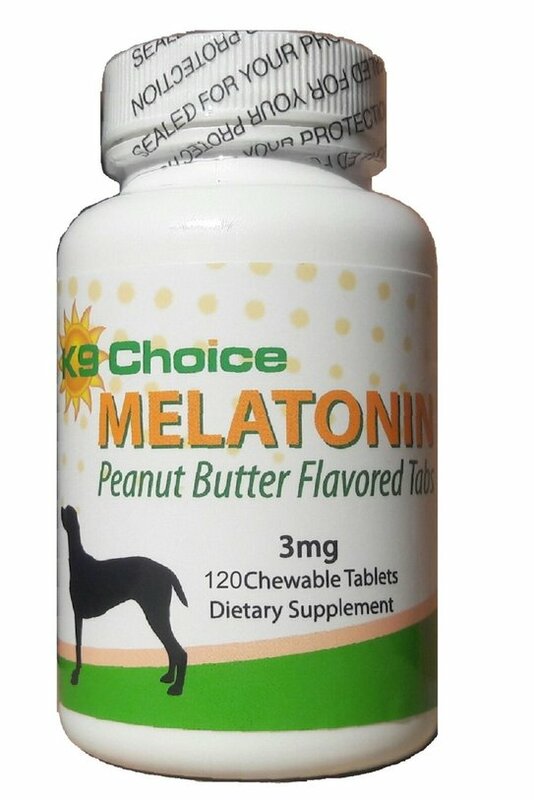 K9 Choice Peanut Butter Flavored Melatonin 3 mg 120 Chewable Tablets, 100 Servings. Now with 20% more! 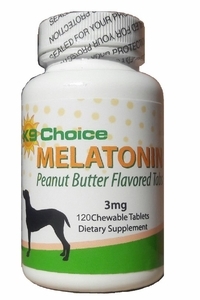 Each bottle contains 120 chewable tablets of 3 mg melatonin in a peanut butter flavor that dogs love. Melatonin is naturally produced by the body in the pineal system and supplementing with melatonin can be highly beneficial. Melatonin is a well known antioxidant and research has indicated that Melatonin can support the endocrine system in dogs. Melatonin can also be used to help calm dogs with heightened Cortisol (stress hormone) levels due to separation anxiety, fireworks, thunderstorms, Canine Cushing's Disease, and other stressful events. Melatonin is often used in conjunction with lignans to help lower cortisol levels in dogs with Cushing's Disease. Lignans inhibit two different enzymes needed in the production of Cortisol and combined, lignans and melatonin can be the basis of an effective approach against the symptoms of Cushing's. Many of the symptoms of Cushings Syndrome are a result of elevated cortisol levels; therefore managing these hormone levels can aid in managing the symptoms. 1 mg of melatonin (you may cut the tablet in half) every 12 hours may be recommended for dogs 10 lbs or less, or for those who want to give their dogs very low doses of melatonin.